The main objective of Frigorífico Pando is customers’ satisfaction, through a continuous improvement of the quality of all products and services, throughout the entire production process. All the activities involved to achieve the established objectives are carried out in such a way so as to cause minimum environmental impact and maintain the maximum degree of personal security. 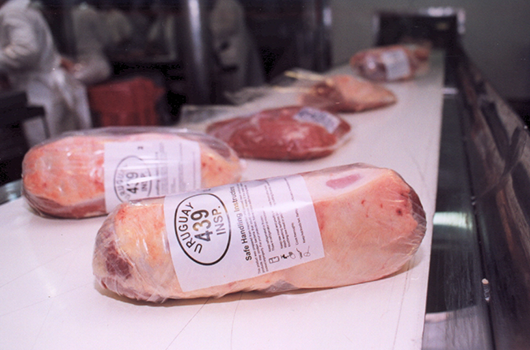 Frigorífico Pando receives standing cattle (principally British breeds – Hereford and Aberdeen Angus) and performs slaughtering and deboning, producing sides, cuts, chilled and/or frozen, and offals. Every detail of the productive process is cared for and constantly supervised. That is why the concept Quality Assurance is so important, where control in the whole production process and permanent training of the personnel stands out. Under the guardianship of the Ministry of Agricultre, Livestock and Fishery, and the National Meat institute, Uruguayan producers have all the conditions to breed strong and healthy cattle. Although most of the slaughter is from grass-fed cattle, we also have Feedlot cattle suppliers. Para satisfacer las necesidades de nuestros clientes en Frigorífico Pando contamos con un destacado equipo de expertos profesionales capaz de seleccionar un tipo de carne para cada cliente. In order to satisfy our customers’ necessities, in Frigorífico Pando we have an outstanding professionals team, capable of selecting the right cattle for each product of each customer. If you have any query, do not hesitate to contact us: telephone 22927826/22922093 ext 743 email: haciendas@fmp.com.uy / cell phone: 099685570. In Frigorífico Pando we take all the needed measures to ensure animals’ health. For that matter, we have a double certification. One is done by the Animal Industry Directorate, of Ministry of Agriculture, Livestock and Fisheries; and another by qualified professionals (veterinarians, chemical engineers, food engineers, etc.). It is a humanitarian slaughter, taking care of animal welfare. Frigorífico Pando has state-of-the-art equipment for the slaughtering process, such as the possibility of using the Restrainer, unique in the region and aligned with the world’s most demanding animal welfare standards. This prevents animal suffering and results in better beef. Frigorífico Pando also has the option of Ritual Slaughter. It is of utmost importance in Frigorífico Pando’s quality policy. Cattle driving towards and in the plant requires of professionalism and special skills. Stress is avoided and animal welfare is guaranteed (resulting in better beef) throughout the whole productive process. Frigorífico Pando has manuals that have been strategically elaborated and supervised by international organisms, that work as permanent quality control tools (in order to guarantee the safety and quality of the food). Microbiological, physicochemical and organoleptic assays for system support. All of them are periodically carried out in the internal laboratory as well as in the plant. These tools are permanently audited by the Ministry of Agriculture, Livestock and Fishery and commercial missions of different countries. All these factors contribute to Frigorífico Pando’s natural, tender, healthy and delicious meat being highly recommended all around the world. Uruguay is a country where the agricultural tradition and the modern combine in perfect balance and harmony. The natural conditions of the field and the pastures are optimal. If we add production systems with constant quality control, and a permanent technological innovation, Uruguay provides its customers around the world with natural, tender, healthy and delicious meat. Traceability is one of the most important characteristics to conquer new markets and to generate transparency and trust in the productive processes. Developed, implemented and maintained in Uruguay by the S.N.I.G. (www.snig.gub.uy), this tool has allowed Uruguay to get the certifications demanded by the most exigent customers all around the world.